Now we can start talking about geometry. Geometry of course is the study of shapes. Now for some people who are visually oriented, geometry comes very naturally. Other people who have not developed their visual skills geometry can be a little bit harder. Especially for the folks who are hard, who geometry is a little bit harder, here's what I'm gonna say. It is not enough simply to watch these videos. After you watch these, get out paper and a ruler and draw these different shapes, actually physically draw them on paper. And build shapes and physical objects, you can use pencils, toothpicks, straws, anything like that. Actually triangles, build rectangles. Actually look at them, use your hands. Our hands are actually part of our intelligence. So if you're using your hands, you're engaging every part of the brain and it will make it much easier to understand all these relationships. So let's start with lines. Lines are straight and they go on forever in both directions. So here we have a bunch of different straight lines in a bunch of different directions. You have to imagine that at the end of each line there's some arrows or something like that that indicate that the lines actually do go on forever in both directions. It's very important not to confuse straight. With horizontal. Those two words have very different meanings, but sometimes there are some students who confuse them. All lines are straight, so all the lines that we had on the previous slide, lines going in different directions, all of those are straight lines, and you can always assume that a line is straight on the test. If it looks straight, it is straight. That is always true on the test. But some lines are drawn horizontally for convenience. But you can never assume that lines are exactly horizontal or vertical simply because they appear so. Now, people get really confused on this. If you're confused, and you think that horizontally and straight mean the same thing. Then when we say the test assumes, test, you can assume from the test that lines are straight. People mistakenly assume that this also means they can assume lines are horizontal. And that is not correct. A line segment is a finite piece of a line. So for example, here we have a line segment. It has two endpoints, and when these endpoints are labeled, that makes it easy to discuss. 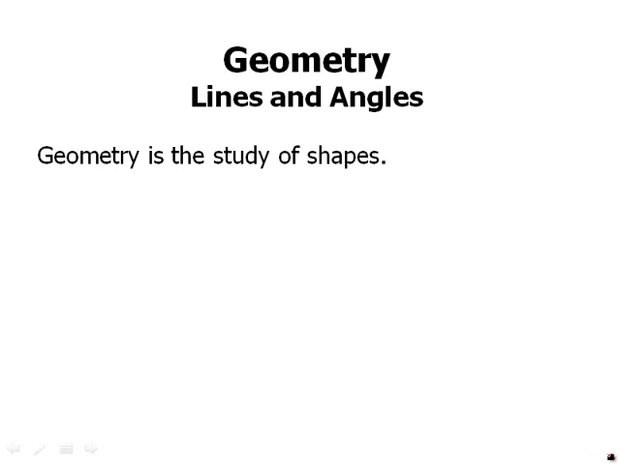 This is line segment AB and for the purpose of the test, AB can either mean the actual shape, the line segment itself. Or it can mean the length of the line segment, the numerical length. An angle occurs between two lines or two segments. So for example here we have an angle. This happens to be between one line and one segment. The best way to understand an angle is to think of it dynamically as the act of turning or rotating. So in other words, going from here to here, that is what an angle is. It's that dynamic space in between the two lines. If we label points, we can talk about an angle. We could call this angle either CDE or EDC. Point D, the vertex of the angle right here, the point at the angle, must be in the middle of the name. And so, we can call it either CDE or EDC as long as the vertex is in the middle. Sometimes in these videos I'll also use a single angle name. If there's no ambiguity. For example, there's only one angle in this diagram so I could call it angle D. Theoretically that could occur on the test, although the test is often careful enough to use a three letter name always for an angle. We measure the size of an angle in degrees. The test can state these directly, so 50 degrees. Alternately, the test can label the diagram and state the measure of the angle in the text. So angle GFH equals 50 degrees, because they put letters on the points in the diagram we can just use that to talk about the measure and the number of degrees in the text. Actually, probably its favorite thing to do is the following. Just specify an angle with a variable number of degrees. This flexible format allows them either to specify the angle, for in the text, they could say x equals 50. Or they could ask a question about it. They could give us other information and say find x. So, they like doing this. We'll do a quick review of basic degree facts. In a straight angle there are 180 degrees. And, of course, remember straight line can go in any direction, but if there's any point on the straight line all the way around from one side of the line to the other that's 180 degrees. There are 90 degrees in a right angle. So here we have two lines intersecting at right angles, there are actually four right angles at that intersection. If the two lines, or segments, meet at right angles, they are called perpendicular. And that is a term you should know. The test can either draw that little square, the perpendicular sign, which si that little square, or it can indicate that the angle is 90 degree. It can label 90 degrees in the diagram or have X degrees and tell us in the text that X equals 90. So there are a variety of ways that they can tell us that it is a 90 degree angle. Don't assume that two lines are perpendicular if you are not explicitly told so. This is often a trap. Suppose these points appear as part of a larger diagram, and no further information is given. Certainly looks like those could be at a right angle, and that's a very tempting thing to assume. The test would love for you to make the mistake of assuming that the lines are perpendicular and that the angle equals exactly 90 degrees. In fact, it doesn't. I've drawn this so that that angle there is an angle of 89.6 degress. So, it's close to being a right angle. And it may look like a right angle to the naked eye but none of the special right angle properties are true. And in upcoming videos we'll be talking more about special right angle properties. None of the special right angle properties are true if the angle is close to 90 but not exactly 90. Very important. So you can not assume that two lines are perpendicular unless you have some sort of justification for doing so. One term I will introduce, which will probably not appear on the test, is congruent. Congruent is like equal for shapes. We use the concept of equal for a number and the very similar concept of congruent for shapes. Two shapes are congruent if they have the same shape and the same size. They don't have to have the same orientation. So for example the purple and the green shapes are congruent one is flipped over from the other, one you could say is a right handed version and the other is a left handed version, but it is the same shape fundamentally, these two are congruent even though they have different orientations. A bisector cuts something into two congruent pieces. An angle bisector cuts an angle into two smaller congruent angles. So, for example, here, we have an angle bisector. If we're told, for example, that the big angle, P and M, is 40 degrees. And that N cubed bisects the angle. Then we can deduce that the two smaller angles each have to be 20 degrees. They each have to be exactly half equal to each other because the angle was bisected. Similarly the bisector of a segment may be a point, another line, another segment, or a line. The bisected divides the segment into two equal halves. So notice here, segment ST bisects PQ. Also notice it's definitely true that PQ does not bisect ST because SR is clearly bigger than RT. So, the fact that. ST bisects PQ means that R is the midpoint of PQ, and that PR equals RQ. We've divided it into two equal halves, and again that's always what bisecting means. Sometimes, a line will bisect a segment and also be perpendicular to it. The line is called a perpendicular bisector of the segment. Line WV here is perpendicular. It's a perpendicular bisector of TU. Every point on the perpendicular bisector of a segment is equidistant from the two end points of the segment. And so that's a really handy fact to know that shows in un a variety of ways. The perpendicular bisector in fact is the set of all possible points that are equidistant from the two endpoints of the segment. Now some basic facts about angles. We've already said that a straight line contains 180 degrees. This means that if two or more angles lie in a straight line, the sum of their angles is 180 180 degrees. So for example, we can assume that that long line is straight. It doesn't have some kind of slight bend at that point. The test will not do that to us. If it looks straight, it is straight. And therefore, we know that those two angles together make 180. So x plus y equals 180. If two angles add up to 180, then they are called supplementary. Two angles on a straight line are always supplementary. So P plus Q equals 180. When two lines cross four angles are formed. So we're, here we have two lines. They're going on forever in both directions. They happen to cross. And these four angles are formed. The pairs of angles opposite each other, sharing only the vertex in common, are called vertical angles. And vertical angles are always congruent. So, for example, A and C.
They don't share any sides. All a and c have in common is they touch at a single vertex. They touch at the vertex. B and d also touch at the vertex, and so that's why they're called vertical angles, cuz they meet at a vertex. So we know the vertical and angles are congruent. We know that a equals c. And b equals d. Of course, the pairs of angles next to each other a plus b, b plus c all of those are supplementary. They all add up to 180 degrees because we have pairs of angles on a line. Therefore, if we are given one angle in this diagram, we can find the other three. For example, if a equals 35, we know that c has to be equal. That also has to be 35 degrees. And b and d have to be the supplementary angle of 145 degrees. So that any two pairs together, any two angles together in a pair, add up to 180 degrees. Here's a practice problem. Pause the video, and then we'll talk about this. Okay. In the diagram x equals 40 degrees, and rt bisects that big angle RSRU which is a very big angel. Well, SRU is the supplementary angle to that 40 degree angle. So SRU. Has to be 180 minus 40, which would be 140. So SRU is 140. And this angle is bisected. Because it's bisected, it's cut into two equal halves. So those two halves, each one has to be 70 degrees. I'm sorry, T equals 70 degrees, TRU equals 70 degrees. Those are the two equal halves of the angle that was bisected. We'll now notice that the angle TRV, that angle is made of TRU and, and angle X, which we know. We know TRU is 70 degrees. We know that, that angle x is 40 degrees. So, we add them together, TRV has to be an angle of 110 degrees. Now notice that TRV is the vertical angle of SRW. So those two have to be equal. So that means that, that SRW also has to be 110 angle so y equals 110. Finally, we will review parallel lines. If two lines are parallel, they never intersect, and they are always exactly the same distance apart. And again, this is another one of these like perpendicular. Close to parallel doesn't count for beans. You have to know that the two lines are exactly parallel. Obviously since parallel lines never intersect, they never form angles with each other, we get many angles though if a third non-parallel line cuts across the two parallel lines. This third line is called a transversal. A transversal is a line that cuts across two parallel lines. So here we have a transversal cutting across the parallel lines WX and YZ. And we get eight angles there. Now the four big angles are all equal, and the four little angles are all equal. So, in other words a equals d equals e equals h and b equals c equals f equals g.
That's the big idea. Now, among these, of course, you may remember from geometry that there's all kinds of special names. Alternate interior and same side exterior, and corresponding angles. If you want to remember all those special names, that's great. You don't need to. All you need to remember is all the big angles are equal, all the little angles are equal. So here's the diagram again. And now I've labeled it, so that it's clear that everything is equal. Also notice that p and q are supplementary. So any big angle plus any little angle equals 180 degrees. That's a really big idea. Thus, if we are given the degrees of any 1 of the angles here, we could find the other 7. In summary, we talked about lines and line segments, we talked about angles and degrees, we pointed out that there are 180 degrees in a straight angle, and 90 degrees in a right angle, we talked about angle bisectors and perpendicular bisectors, an angle bisector divides an angle into two smaller equal angles. A perpendicular bisector is perpendicular to a segment and divides it into two equal halves. We talked about how two angles on a line are supplementary. Vertical angles are congruent. And we talked about the angles formed by a transversal intersecting a pair of parallel lines. And we will talk about many applications of these fundamental ideas in the upcoming videos.